Languages can be study using similar tools as we use for biological organism, because languages, like species, have their geographic distribution, they have variability, they evolve with time, they show divergence and extinction processes. In fact there are phylogenetic trees and networks of languages  similar to those we build for understanding species evolution. 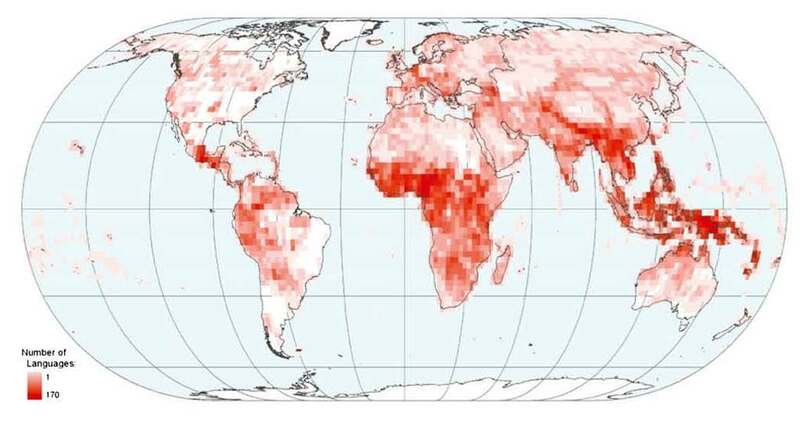 In addition, a recent paper show that the hotspots of species diversity also co-occur with hotspots of language diversity , in such a way that highly biodiverse areas accounting for 24% of Earth’s land surface contain ca. 70% of the world’s languages. However, the reasons of this link is not yet well understood. Are the factors that generate linguistic diversity the same to those that generate biodiversity? Is the linguistic diversity a consequence of the biodiveristy? Nearly 60 percent of the languages in high biodiversity regions, like Amazonia and the lowland forests of West Africa, are spoken by fewer than 10,000 people; more than 1,200 of those languages are spoken by fewer than 1,000 people. So cultural diversity, as biological diversity, is threatened. It is worth mentioning the recent online collaborative effort trying to preserve samples of endangared languages . Diversity of languages, jgpausas.blogs.uv.es, November 7th, 2010. Linguistic diversity has many commonalities with species diversity, and the two disciplines are sharing methodologies. Few years ago, Gray and Atkinson (2003) showed a phylogenetic tree of Ind-European languages [1, see tree], a tree similar to those used in evolutionary biology. This is because languages contain a lot of historic information, like species. In this line, an interesting and recently compilation of papers show the state-of-the-art of evolutionary approaches to study cultural and linguistic diversity . 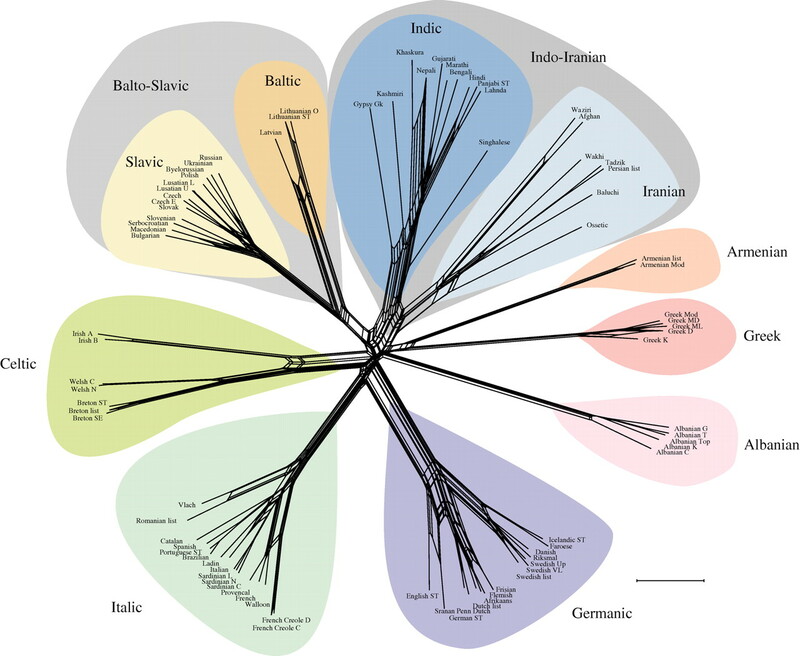 For instance, we can see a phylogeneitc network of the Indo-European languages (see below, by Gray et al.) or the extinction trends of a language (e.g., the case of Gaelic in Scotland, by Kandle et al. [see figure]). Jarret Diamond recently highlighted the benefits of learning several languages . Apart for the obvious social benefits, there are also health benefits of multilingualism like protection against Alzheimer’s dementia in old people . What it is unclear is whether the health benefits increase with the phylogenetic distance of the languages learned, or not. … So there is still a lot of room for including evolutionary approaches in social and medical sciences. Gray RD and Atkinson QD 2003. Language-tree divergence times support the Anatolian theory of Indo-European origin. Nature 426: 435-439 (27 Nov. 2003). Diamond J. 2010. The Benefits of Multilingualism. Science 330: 332-333 (15 Oct. 2010). NeighborNet analyses of the Indo-European lexical data. Scale bar, 0.1. (Grey et al. 2010, Phil. Trans. R. Soc. B 365: 3923-3933).